The Pheu Thai Party has pleaded with voters to cast their ballots for all of the party's 250 constituency candidates in Sunday's general election. "We [Pheu Thai] need 250 seats to compete against 250 new senators," Sudarat Keyuraphan, one of party's prime minister candidates, told media on Friday before she took the stage in the final rally. Sudarat referred to the 250 senators who will play a major tole in voting for the next PM. The senate will be picked by the National Council for Peace and Order. She appealed to voters for a landslide win so they can form the next government. With a tactic to win the most party-list system seat, Pheu Thai sent only 250 constituency candidates and left the rest for its sister-party Thai Raksa Chart to fill the candidates. The party sent only 250 from a total 350 constituency candidates. Thai Raksa Chart was dissolved early this month after nominating Princess Ubolratana as its PM candidate. 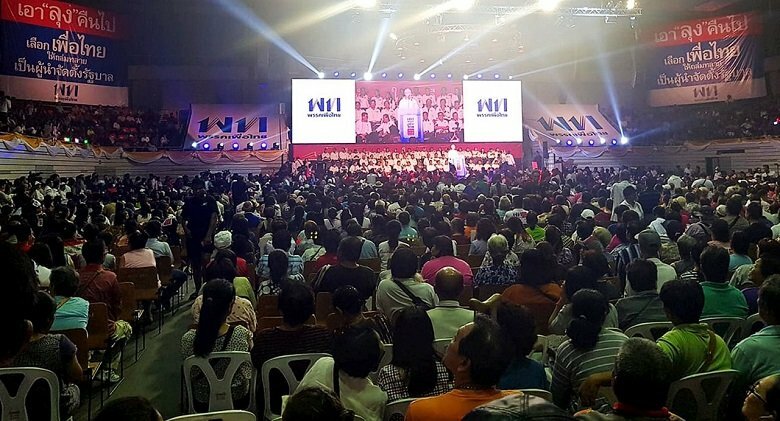 "In constituencies where we have our candidates, please vote for us and do not vote for other parties otherwise the votes will be shared by others,"
Bhokin Balakula, a Pheu Thai key figure, told supporters at the rally. But if any constituency has no Pheu Thai candidates, you can vote for pro-democracy parties, he added. Phue Thai staged its rally at The Thai-Japanese Stadium’s Keelawes 2 in Din Daeng district where thousands of supporters joined. It does not matter whether Pheua Thai actually secure a landslide victory: this result (if it happens) ain't never going to be told by the Authorities to the great Thai public! Agreed. A fix is complete, not partial. The princess attending Thaksin’s daughter wedding in HK may influence the election. this being a "general election" is enough indication as to "who" will get elected. Agrred. It was a very powerful statement and is all over the Thai news. The current government WILL remain in power no matter what happens but I just wonder if they will announce fake results or not. It would be conclusive then and leave little room for protest as we all know what the result of an EC investigation would be. There will be a landslide yes- but for the Future Forward Party. What they did not think of when they fixed the elections in advance is if they try to remain in power the country will be ungovernable and nothing is worse for the economy and investment. If Prayuth tries to hang on as an outsider PM with let’s say a Phua-Thai / FFP coalition they will just ignore him - a PM without a government that backs him up is useless. Years of squabbling and law suits follow and this will turn investors away and Thailand is already taking last place behind it’s neighbors when it comes to GDP growth thanks to 5 years of corruption and mismanagement. Thanathorn is already calling to form a coalition government between all democratic minded parties to gain 376 seats to oppose Prayuth and his puppets in the senate - only the “Democrats” under Mark the traitor remain a point of concern - Mark is flip- flopping again but he will get a surprise in the South I believe - loosing big to FFP. For the times they are not changin'. She has large followings and what she say and do are shared in the social media. Her foundations has 31 million young fans and her personal instagram has 100,000 followers. I am sure she has big influence to the educated middle class who are basically politically neutral and will also nudge the young voters to come out. The junta can’t lose this election and I am sure there will be lots of horse trading to incentivize cobra parties to join his coalition and get him elected as PM. The crony agencies like the EC and NCPO will be working overtime to manufacture charges to influence the election results. Will the people’s mandate for pro democracy be so large that the cobra parties turn against the junta. Waiting for that sequel post election. I'm thinking the only backing he needs is guns and tanks. When exactly will the results be known? I am confused on this issue...I thought it was supposed to be 2 months from now or something completely absurd like that...but then I read yesterday that it would by known by late Sunday. Anyone have any clarity on this? It goes like it always did, first they'll try to get the winner somehow dismantled in court for, well we had it all, like cooking show on TV. Does that not work out we get the nice street clashes again, after that the next coup. History repeats itself, in Thailand a bit faster than in the rest of the world.